Is East Boston Waterfront the Next Seaport? In what has always been a gateway community, an adjunct to its big sister Boston and to a lesser degree the Seaport District, East Boston has quickly been shifting from forgotten sibling to the city's next big thing. Rental prices are reflecting the growing sophistication of East Boston, with average monthly rents climbing more than 40 percent in four years to hit a high of $2,255 last year, says The Boston Globe. This rise has brought the neighborhood in line with rental prices throughout the rest of Boston. Over the last several years, plans have been in place to add more than 1,000 new units, initially to drive down those high rent prices so it could attract the budgets of college students and budding professionals. 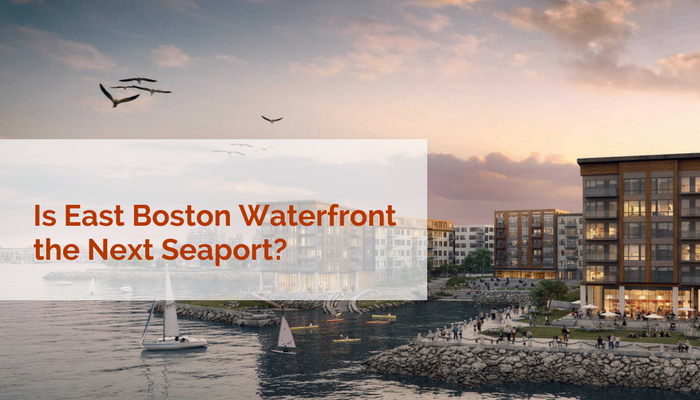 Turns out, these modern waterfront developments are enhancing East Boston's allure as an up-and-coming community that rivals the popularity of the Seaport District next door, which is already well established as the hottest neighborhood in town. The amenities that make the Seaport District so appealing (prime waterfront location, across from downtown, right off the highway, a short T ride to the airport) are all the things that are making the same impression on the East Boston waterfront, points out Boston Magazine. One-minute walk to the Blue Line T Stop. Get to State Street downtown in three minutes. Half mile to Downtown East Boston. Soon you'll be in the middle of the city's exploding arts and cultural scene from the Downeast Cider House to the landmark Santarpio’s Pizza. There are a number of trendy bars and the latest restaurants to choose from. It all depends on what you're in the mood for. Some say you can get the absolute best view of Boston from here. There are many reasons why you should get in on the ground floor for East Boston waterside living. Not only are the prices lower throughout the city, it's just a quick T ride to downtown, containing eclectic restaurants for the foodie in you and boasting a killer view of the Boston skyline, says The Boston Globe. It's no surprise, then, that East Boston is capturing the attention of young professionals, savvy families, and college kids. More and more people are making the migration across the Harbor to the next Seaport District in the making. Want to be a part of it? You can. Getting in on this amazing opportunity to become a part of this up-and-coming waterfront area is easy. Just get in touch with Elevated Realty at 617-701-6300 or email us at info@elevatedboston.com. Our headquarters is located at 174 Dorchester Street in Boston, MA. We would be happy to discuss the plans for Slip65 with you and book an appointment. Start looking forward to living in luxury marked by jaw-dropping views and convenient access to everything you need!